I can’t wait! 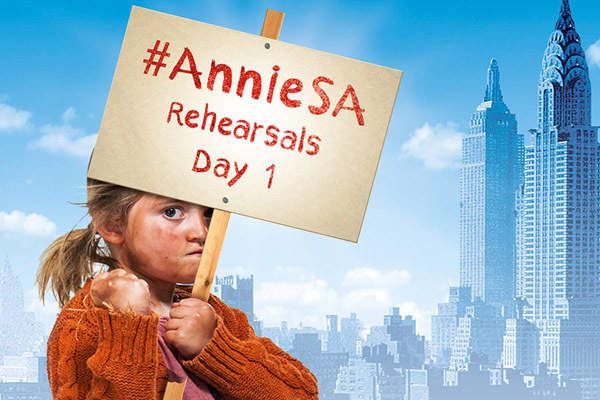 Seeing the unusual, inventive set of this sparkling new production of ANNIE, I can’t wait for it to open on stage here in Mzansi – first at the Montecasino Teatro in Jo’burg from 12 October and then at Artscape in Cape Town from 02 December. And of course, I’m very partial to our South African actors! I know I’m biased but that’s because time and again, when I’ve watched video clips of overseas productions and then seen the local cast on stage, the talent, energy and commitment of our performers has outshone the others. ANNIE SA has a cracking cast …. Charon Williams-Ros (Mrs. Lovett in Sweeney Todd) is the tyrannical Miss Hannigan and Neels Clasen(Mamma Mia!, We Will Rock You) plays Daddy Warbucks. Taryn Sudding (CATS, Sound of Music) plays Grace, with Stephen Jubber (Sunset Boulevard, Jersey Boys, Mamma Mia, Jesus Christ Superstar) as Rooster and Delray Halgryn as Lilly. Mike Huff (Phantom of the Opera, The Sound of Music), Candice van Litsenborgh (Audrey in Little Shop of Horrors), Stefania du Toit, Jenna Robinson Child, Michelle Lane and Hope Maimane complete an all-star South African cast with a special appearance by Grant Almirall (star of Singin’ in the Rain and Jersey Boys) as Bert Healey. Following an extensive 6-month nationwide search we have found the three best Annies in the country – Emma-Rose Blacher, Lilla Fleischmann and Caitlin Dicker! DON’T WAIT UNTIL TOMORROW, BOOK YOUR TICKETS NOW!